We are an active church in our community and in our world that shares a living, daring confidence in God’s grace. Liberated by our faith, we embrace you as a whole person — questions, complexities and all. Join us as we do God’s work in Christ’s name for the life of the world. This event is held in Holy Trinity's Fellowship Hall. 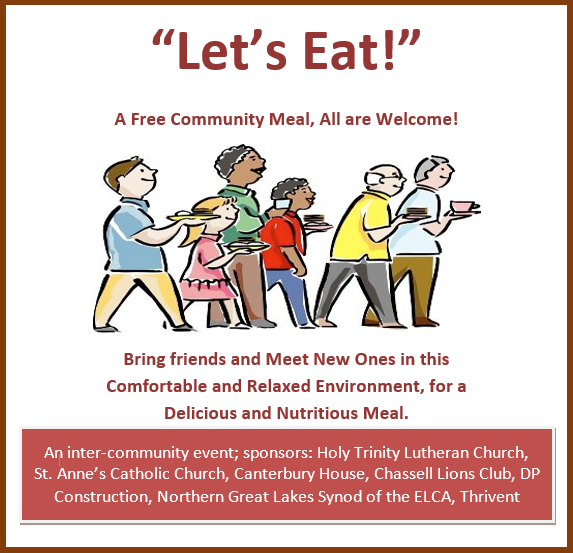 If you are interested in attending and would like more information or would like to make a donation or volunteer for one of these meals, please contact HTLC's office at office.htlc@gmail.com or 906-523-4315. Prayer Shawls have been made for centuries; they are universal and embracing: they comfort and enfold; wrap and warm; mother and hug; shelter and embrace. Those who knit and receive shawls and robes are blessed. Please let us know if you would like participate in making, receiving or distributing prayers shawls. ​We are currently out of prayer shawls and are seeking some creative souls to create some for the Church. ​The pattern is available at the office too. Prayer is the exercise of faith and hope. We all yearn for closeness with God and long for God's healing, strength and compassion, especially in times of need. ​Holy Trinity's Service & Witness team coordinate meals to accompany people in need following a surgery, a birth, loss of a loved one or time of sickness. Please contact the office if you know of someone who may want to participate. through annual donation of supplies. Omega House is a licensed Adult Foster Care seven bedroom hospice home that opened in 2005 with community support and involvement. In a homelike environment, terminally ill residents can live fully, free from pain and social isolation. Omega House provides compassionate care and attention 24 hours a day, 7 days a week. Trained "Resident Care Assistant(s)" are on duty 24 hours a day, 7 days a week with over 4,000 hours of volunteer assistance per year. Any persons in a hospice program or who would qualify for hospice care is eligible to live at Omega House. Medications, supplies and equipment are usually paid for by Medicare, Medicaid and most private insurances. Contact the office for a current list of supplies needed for the Omega House. Each fall Holy Trinity collects school supplies for kits that will be sent out to children in need around the world through our partnership with Lutheran World Relief. These supplies mean the different between getting an education or not for the children who receive them. Click here to view where school kits go or download the latest LWR Quilt & Kit report. Every Tuesday 9am-Noon our Quilters gather in the fellowship hall to make LRW Mission Quilts. All are welcome to participate and learn how to provide comfort in the face of disaster, poverty and suffering. At 10am projects pause and the quilters gather for a time to socialize, have a treat and drink coffee. Following each quilting session, most of the quilters go out to a local restaurant for lunch as well. In 2015, HTLC sent 300 quilts to people in need locally and around the world because of volunteers who ironed, cut fabric & jeans, tied quilts, sewed and packaged quilts. download the latest LWR Quilt & Kit report. Every synod in the ELCA ﻿﻿has a companion synod. These companion synod relationships help us learn more about our brothers and sisters in Christ throughout the world. Here in the Northern Great Lakes Synod , our companion synod is the Eastern & Coastal Diocese of Tanzania (ECD). This unlikely match with a rural 94 congregation Synod in the Midwest and a large urban Diocese serving 52 parishes with many sub-parishes in the largest city in Tanzania began in 1991. It has proven to be a true blessing to all who have participated in the activities of the partnership.